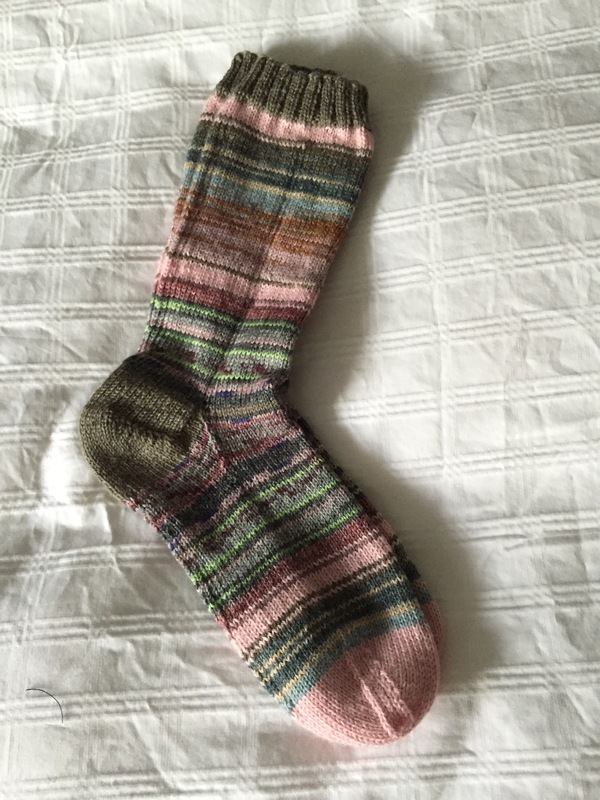 Been working away at this pair of socks for the past couple of weeks – slowly, in part, because the weather has been so humid the yarn was sticky and difficult to knit with, and because there was tennis on TV! Can’t knit and watch tennis, too. The weather cooled and became a bit drier just before the weekend so I could knit again (and the US Open 2015 didn’t start till today). Finished this pair last evening. I’m determined to use up the leg-length leftovers I have in the stash before I buy any more yarn. I’ve gone through the basket and matched up the yarns with one another and with solids – put the balls in plastic bags – enough in each bag for one pair of socks. It looks like I might have leftover yarn for a half a dozen pairs. This is the first of the “leftover” socks. You can barely tell there are two different patterned yarns – they are interesting enough that I’ve put them in my sock drawer. Now on to the next pair in blues, mauves & purples. A friend asked me today how my sewing class was going – because I hadn’t written about it afterward. In part, it’s because I didn’t take photos during the session, and also because I haven’t yet got to working on the denim jacket I’m making for myself. I do have to get to it, because Thursday will be here before I know it and I, too, need to have my “homework” completed. Thursday was our second class – I wanted us to have the fronts and back assembled so we could try the body on and make any adjustments that were needed. We took in princess seams (both front and back), lifted shoulders a smidgeon, took in side seams a bit, particularly under the arms… We adjusted sleeve patterns just a tiny bit so the cut out sleeves will fit the armscye where we’ve changed the side/shoulder seams. So homework this week: to cut out the sleeves, assemble the bottom pieces, attach to the upper sleeve, sew sleeve underarm and insert sleeves into the body of the jacket. 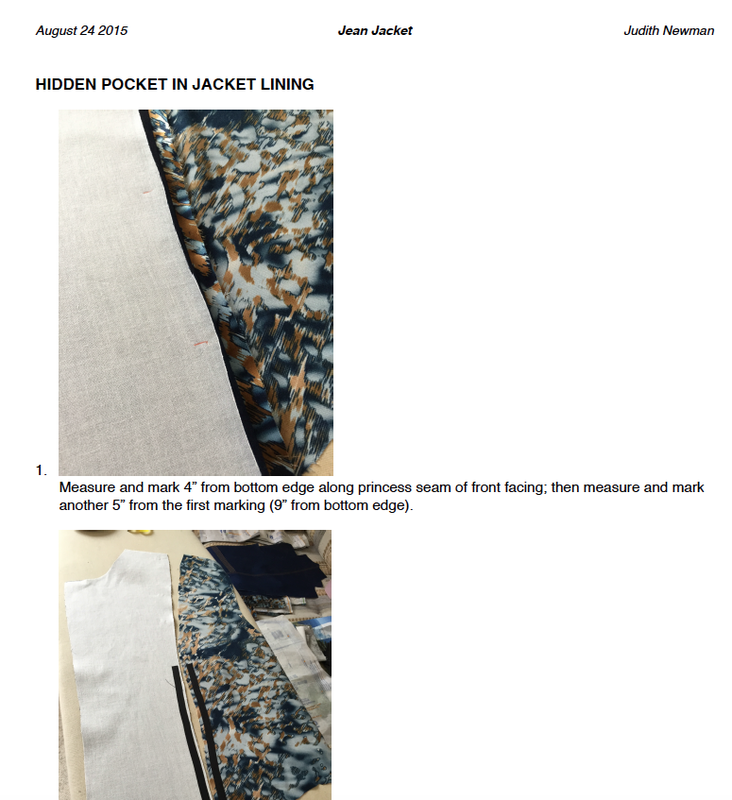 We worked on two things in class: creating and inserting the hidden pocket in the lining. I had prepared a set of instructions for making this hidden pocket so we had something to work from. I had made the first pocket in my jacket lining before class; I finished the second one during the session. We also worked on shoulder pads. I had done some research on shoulder pads (the jean jacket is shaped to accommodate them). I had decided the instructions I found in an old Reader’s Digest (1979) “Complete Guide To Sewing” would work well. So I showed them the pads I had made, and shared with them the “pattern” pieces I’d prepared to construct them. Everybody went home pleased at having made considerable headway on their jackets. When I tried on the body of my jacket I thought the front at the sleeve gaped a bit so I created a small dart in front (from bust point to armscye), then basted in the sleeve top to see how it would fit – no go! I’d put in a temporary dart in the front of the sleeve so it would fit the opening and adjusted the underarm seam. The whole assembly pulled and the sleeve twisted! So I took out the dart in both sleeve and jacket front and basted the sleeve back in. Definitely a better fit. 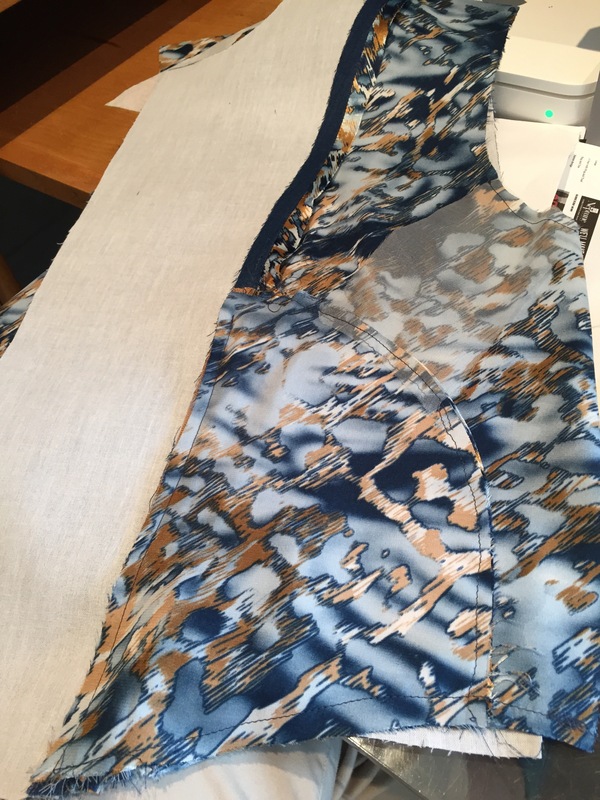 Now I have to removed the sleeve, press the front and sleeve top (to remove the needle holes left from the basting) – assemble the sleeve and sew it all back together again. The back lining is ready to go, as are the two front lining panels – all I need to do is join them at the shoulders and side seams; won’t take long. Then I’ll put sleeves in the body and in the lining and stop there. Next class (#3) we’ll make the last adjustments to the fit, then join lining to body with the collar. Once that’s done, we’ll be able to add the bottom band and sleeve inner cuffs which join lining to body at those two locations finishing the jacket construction. The last step will be buttonholes and buttons and the jackets will be complete. Yesterday I could feel it in the air. “The closing down of summer…” as Alastair MacLeod describes it in his wonderful short story of that name – the first in his collection “As Birds Bring Forth The Sun.” Yesterday there was a hint of the chill to come, although the temperature was in the 20s; a smell unmistakable and yet indescribable. It was there. 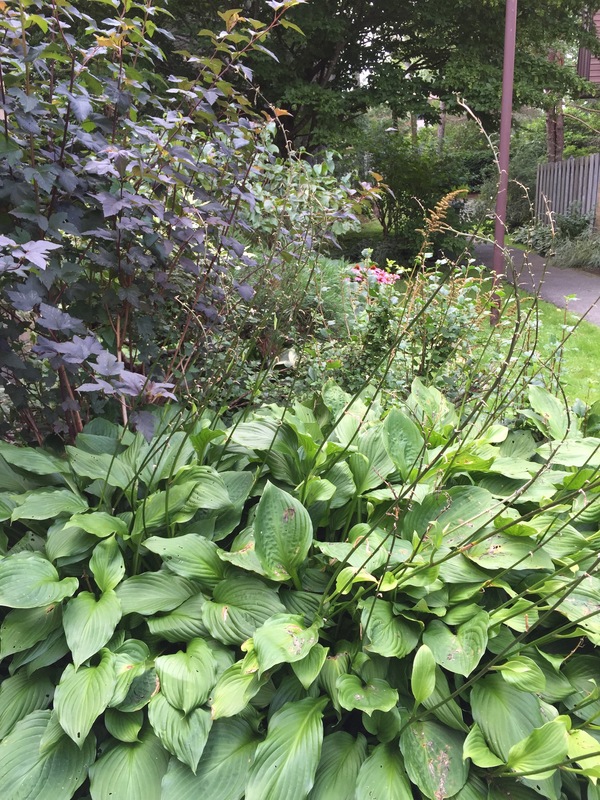 The hosta flowers have been finished for more than a week – I’ve been meaning to cut the stalks off for a month, the pruners have been sitting on the bench in my front hall waiting for me to get to the task – just haven’t done it yet. 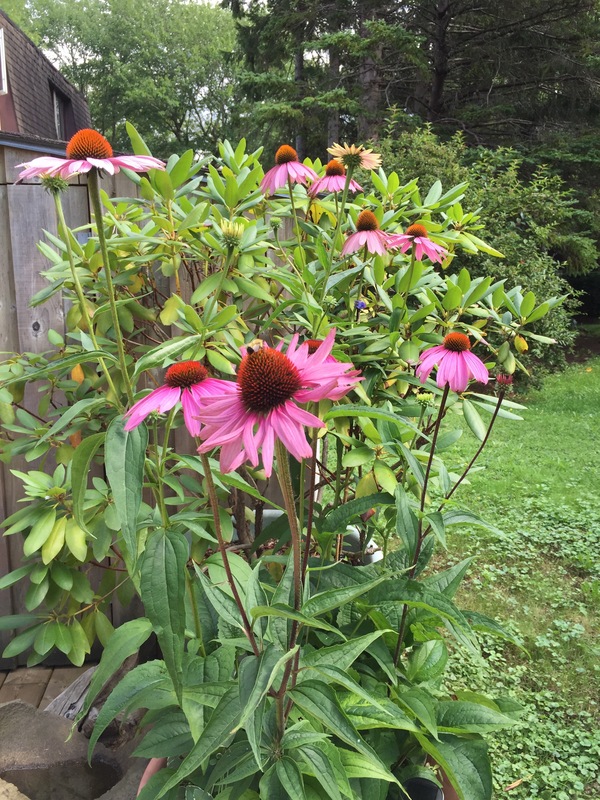 The bees are busy harvesting pollen from the echineacea – more bees than I’ve seen all summer long – they know the season has begun changing. I haven’t spotted any blue chicory along the roadside but there’s lots of goldenrod around. It all reminds me of a seventh-grade science project – the seed chart – a sheet of bristolboard filled with samples of local wildflower seeds in small bags and carefully labelled – that’s why I recognize our fall wildflowers and remember their names. For the next six weeks or so Nova Scotia’s weather will be our best of the year – warm, often sunny days with comfortable, cool evenings. Nobody travels far in September/October – we don’t want to miss a moment of it! For soon the cold and snow and short days will be upon us… And we’ll be yearning for our wonderful early fall weather which seems oh so brief. 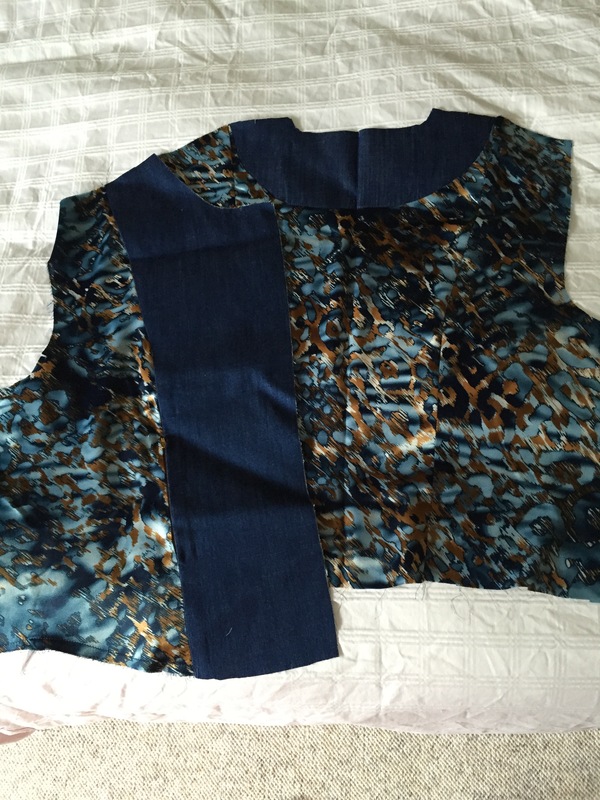 Last week I began teaching a class at Sew With Vision on the Jean Jacket (V1036 – Sandra Betzina, Today’s Fit). In our first class we spent time tracing the pattern pieces [HINT: rough cut each complete piece in all sizes, with a highlighter mark the size corresponding to your largest measurement, tape the rough cut piece to your cutting surface, place tracing paper (I find the paper used in the doctor’s office for examining tables excellent – crisp and sturdy) over pattern and tape corners (to prevent paper moving while you’re tracing), then trace the size you’ve marked, including all markings. In another highlighter colour, trace those areas of the pattern which correspond to your smaller measurements. With a pencil use a French curve to link the different sizes as smoothly as you can]. Then cut out the traced pattern pieces (return the original pieces to the envelope uncut!). Next we joined the traced paper pieces together – pinning on seam allowances – and checked the fit. We made adjustments wherever they were needed (shoulder, princess seams, side seams). We marked the pinned adjustments on the paper pieces, and retraced the pattern pieces if the adjustments were substantial. 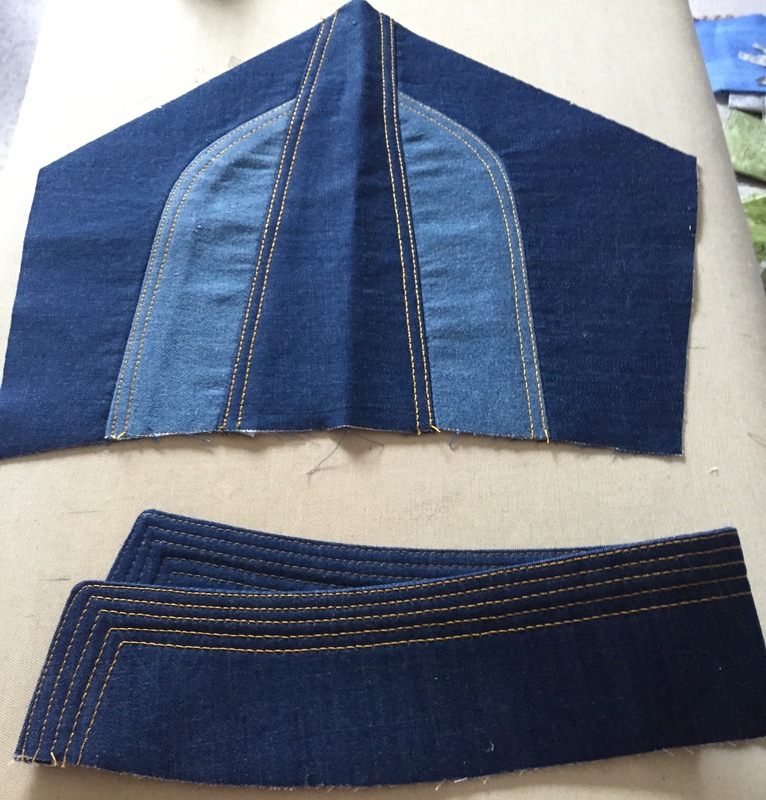 Sew the fronts, the backs (without edge/top stitching so that size adjustments can be made easily). 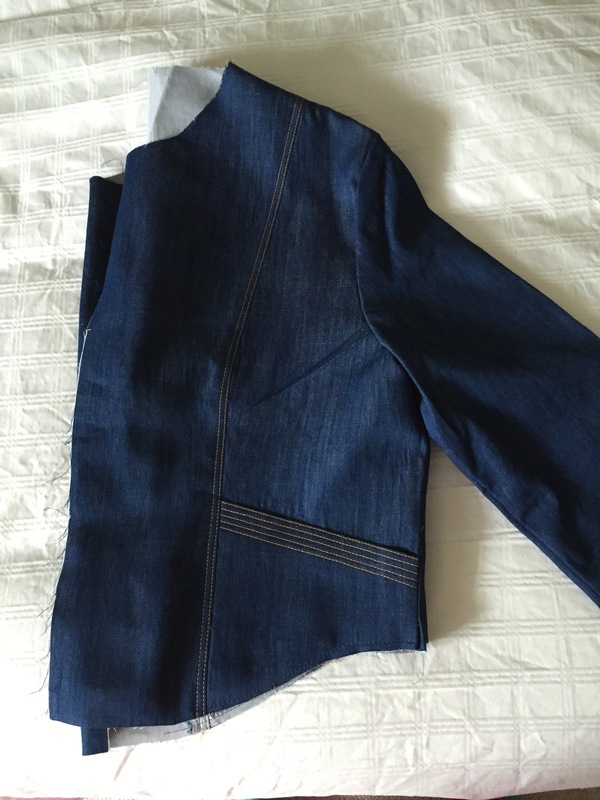 Because I know my jacket fits (having already made two), I did the edge and top stitching as I went along. Then I made shoulder pads using a technique I found in The Reader’s Digest Complete Guide to Sewing, 1979, pp: 376-377. Because the two outside front pockets are decorative (not useful) I want the gals to learn how to construct a hidden zippered front pocket which gets inserted between the front facing/front side lining panels. I did one side, and set up the second. I prepared instructions for the gals to follow since this pocket is not included in the original pattern. I’ll share more as we continue building our jean jackets over the next three weeks. 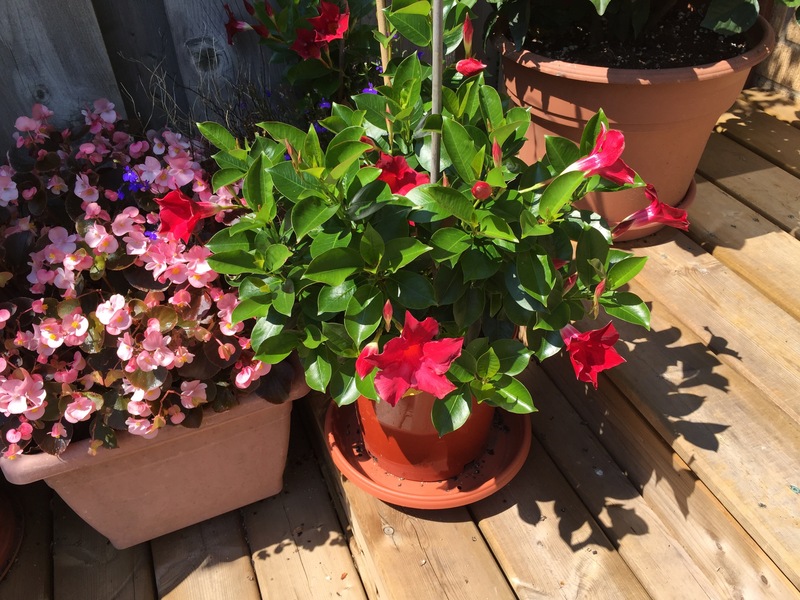 The red Mandevilla has finally taken off – it believes our warmer weather means summer. Each bloom lasts a day or two and before one drops off, another has already opened to take its place. I will definitely plant these again next summer! 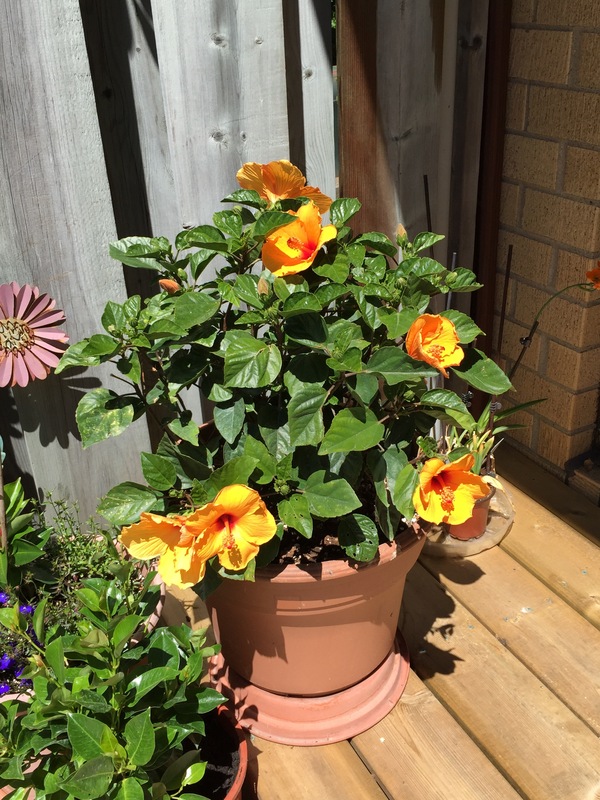 Last year I was lucky if I got one new bloom a day – this hibiscus has been prolific! I’m getting 3-5 flowers every day. This plant could use a good home for the winter – I can’t bring it in because I don’t want to introduce outdoor insects to my indoor plants! Bees and other pollinating insects are back again this year. 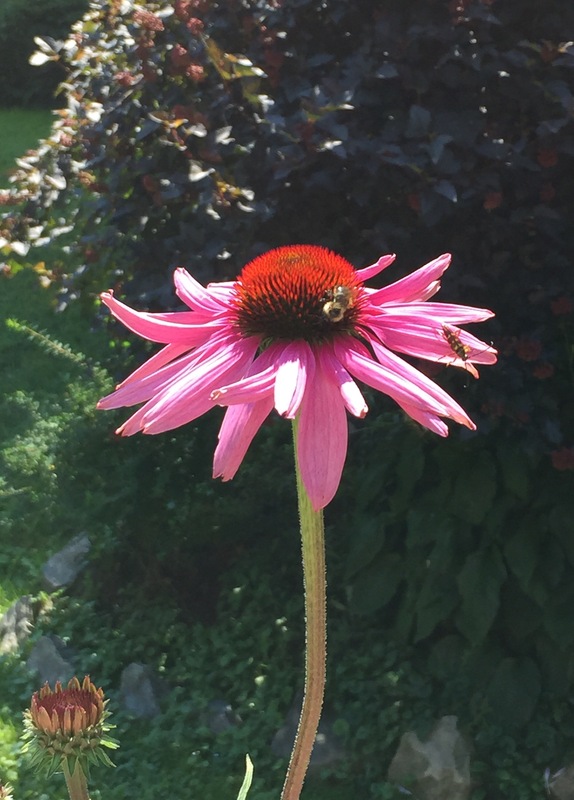 I haven’t seen a lot of bees this summer, but as I was standing, watching, I saw three visiting this one echinacea flower at the same time. Looks like it’s a favorite of a lot of different insects!